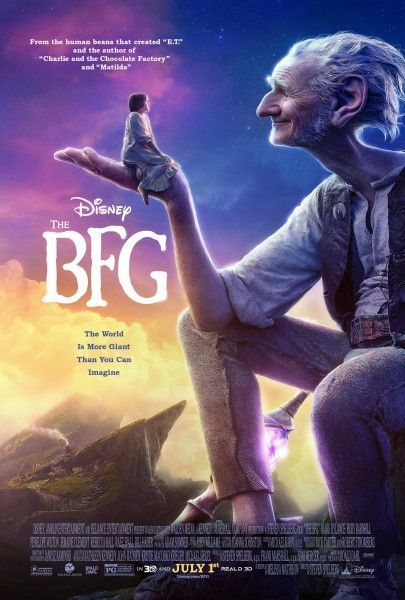 Directed by Steven Spielberg, the Roald Dahl beloved classic tale The BFG tells the imaginative story of a young girl and the Giant who introduces her to the wonders and perils of Giant Country. When precocious 10-year-old Sophie (Ruby Barnhill) lets her own curiosity lead her straight to a Big Friendly Giant (Mark Rylance) that is 24-feet-tall with enormous ears and a keen sense of smell, she quickly learns that he is also quite gentle and charming, unlike all of the other scary and much bigger giants. 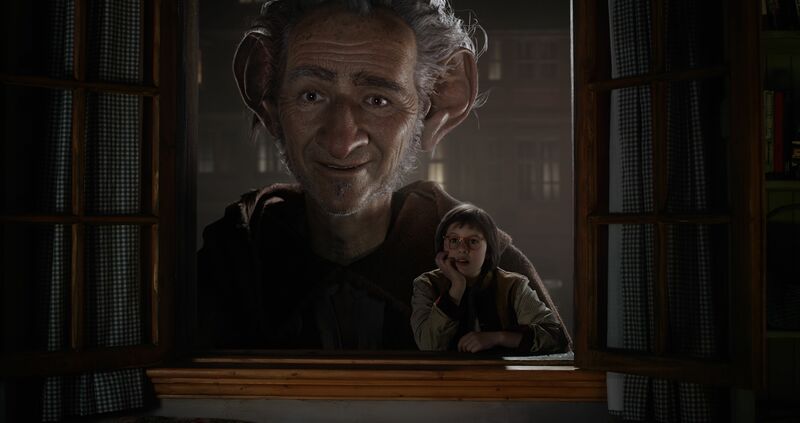 This new and unlikely friendship leads Sophie to encourage The BFG to come up with a plan to get rid of the other giants, once and for all. During a roundtable interview at the film’s press day, iconic filmmaker Steven Spielberg talked about balancing new technology with the heart of the story, how that new technology likely would have destroyed Jaws, the appeal of a young girl as the protagonist, establishing a relationship with his young star, why it’s taken him this long to have a fart joke in a movie, and what he learned on this film. He also talked about what attracted him to his next film, Ready Player One, and his decision to cut out most of the references to himself. Question: With such advances to technology, the challenge is to balance those advancements with the humanity of the storytelling. How do you find that balance between pushing forward while still keeping the heart? 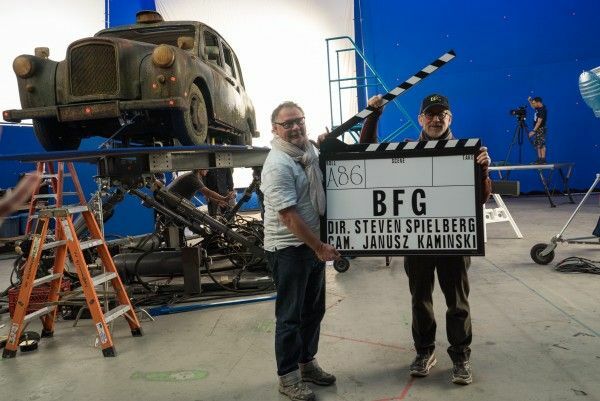 STEVEN SPIELBERG: The whole nature of my approach to The BFG was to be able to use technology to advance the heart and create a flawless transposition between the genius of Mark Rylance and the genius of WETA, as they were able to digitally translate Mark’s soul onto film and the character of The BFG. So, all the work we did was to get back to basics. I knew Mark was really going to knock this out of the ballpark, but I didn’t want the ball to land at the end of a motion capture volume. I wanted the ball to land in the lap of the audience. WETA paid more careful attention to how to preserve what Mark had given us on the day. Their artists did an amazing job translating Mark accurately. About 95% of what Mark gave me and Ruby [Barnhill] is on the screen now, and that’s because technology today allowed us to do it. Five years ago, we could not have made The BFG this way. The technology wasn’t there for it. Do you ever think about what you could have done with Jaws, if you’d had such advanced technology then? SPIELBERG: I think if I had the computer and if I had digital artists, the way we have them today, in 1974, I probably would have ruined the movie because you would have seen nine times the amount of shark. I think what makes the movie is the dearth of shark. This story is definitely Spielberg territory, with a child meeting a creature. What made this variation of that appealing to you? What was the process for casting Sophie and finding Ruby Barnhill for the role? SPIELBERG: [The casting director] looked at 300 or 400 girls, in five English-speaking countries. I looked at about 150, myself, and when I saw Ruby’s reading, I went crazy. I had been looking for eight months. We’d get the Ireland tapes in, and then we’d get the New Zealand tapes in, we’d get the Australian tapes in, we’d get the Wales tapes in, we’d get the English tapes in, we’d get the American tapes in, and we’d be looking and looking and looking. I was shooting Bridge of Spies, and thought I was never going to find my Sophie, until half way through the Berlin shoot, when I saw Ruby’s reading. I immediately went crazy. My wife (Kate Capshaw) was with me, and I showed it to her. She had seen a lot of the tapes with me, and she thought Ruby was glumptious (Gobblefunk for scrumptious). So, we flew Ruby to Berlin and I met with her. My wife interviewed her while I videod it on my iPhone. I didn’t talk to Ruby, at first. My wife did. I wanted to stay out of it and just let them just get into a conversation. And I cast her before the day was over. Do you identify more with the young girl who’s chasing dreams, or the older figure who’s giving dreams? 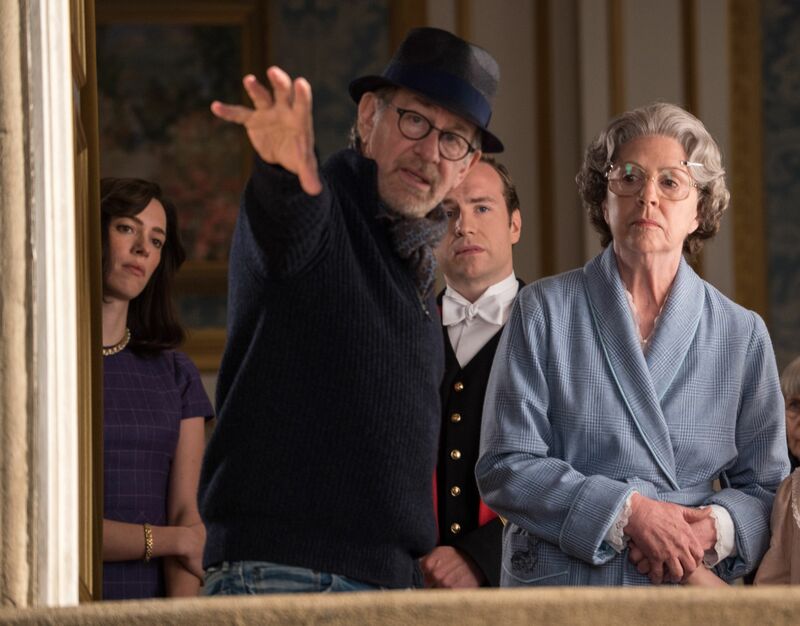 SPIELBERG: I related to Sophie, pretty much throughout the whole story. Sophie was my spiritual guide through the process of telling this story. Everything had to go through the Sophie filter. My feelings about The BFG, my feelings toward The BFG, and the evolution of his character didn’t go through me. It went through me imagining that I was her. What is your favorite part of the film? 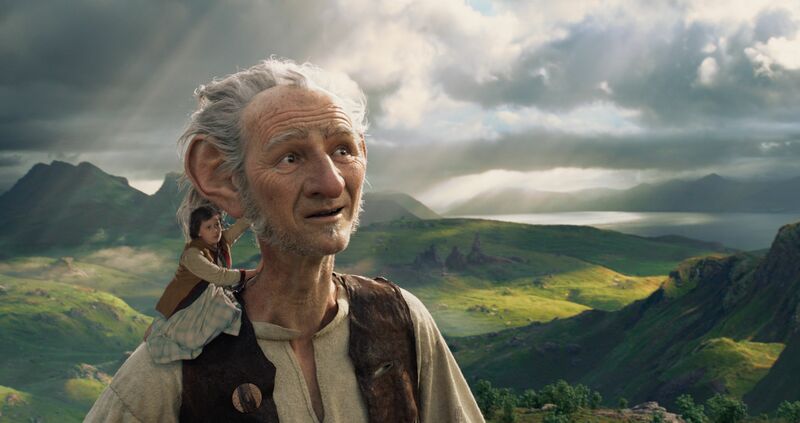 SPIELBERG: I think my favorite part of the filming is when The BFG and Sophie were chasing dreams in Dream Country. The BFG says to Sophie, “Use your titchy little figglers. Go on.” We had a whole set. That was a big set with a whole system of big roots, deep into the ground, and she gets to run under all the roots and chase the dreams. Of course, there were no dreams there. There were just a lot of lights on sticks. But, that was a fun four or five days. That whole sequence chasing dreams and talking about dreams was my favorite. Is this your first fart joke in a movie? SPIELBERG: Yeah. It took me a long time. I guess I’m modest when it comes to flatulence. Except when it’s being done by either giants of Corgis, I’ve gotten over my modesty. Do you feel like you still learn something, as a filmmaker, with every movie you make? What did you learn making this film? Was it important for you to not fall into any of the typical tropes with this type of film? 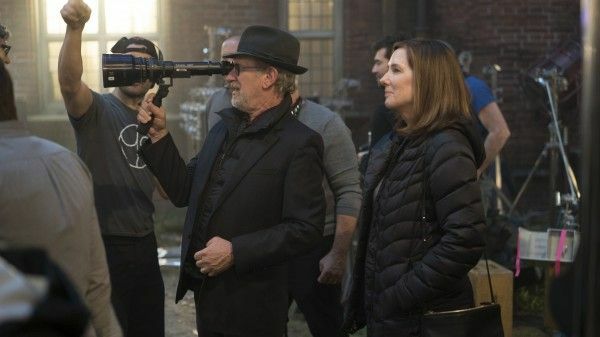 SPIELBERG: The script went through many, many drafts, after I first read it, but Melissa [Matheson] had already done four or five drafts before I read her work. One of the things I said, aside from that it needed more plot – and Melissa agreed, and with the permission of the Roald Dahl estate, we were able to add plot that’s not in the book to make it more of a three-act story – was that it’s gotta go faster. Melissa was very patient and very spiritual, and she kept saying, “Now, Steve, you know that this isn’t one of your Indiana Jones movies. You should just relax because this is going to be one of those stories where the pauses are just important as the words I’ve written and the words Dahl has written. The pauses, the spaces and the patience of the storytelling, don’t rush it because it doesn’t work rushed. It only works unfolding the way it’s unfolding.” That was the best advice she could have given me, and she was absolutely right. The film has its own bio-rhythm, and you can’t push it. Why were Ruby Barnhill and Mark Rylance the perfect companions to bring those quiet discoveries to life? 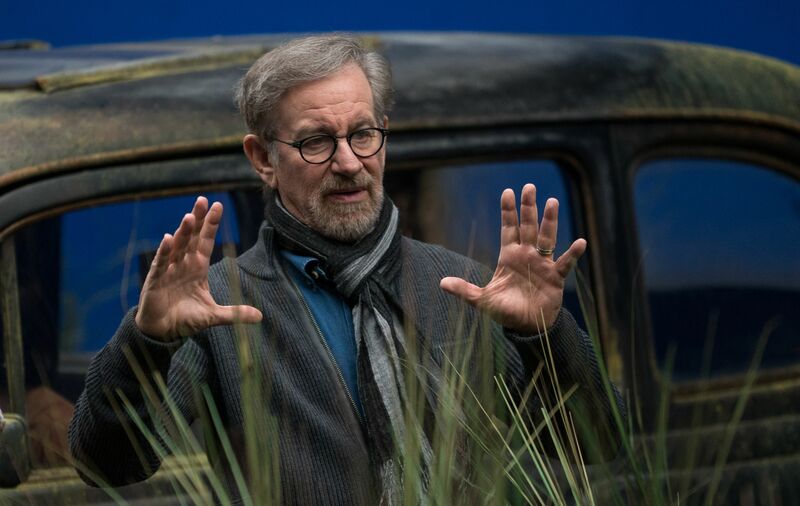 SPIELBERG: Well, they hit it off immediately. When we were in Berlin, Ruby’s next stop was to meet Mark, and he was in the U.K., where Ruby is from. So, Ruby went back to England and spent three hours with Mark. They teased each other, all through production. There was a whole life that was occurring while their characters were having their own lives. It wasn’t that much different – the characters from the [actors]. They spent a lot of time together. When we were setting things up, they’d be playing table tennis, or they’d be playing basketball outside. Where the trailers were, we had a basketball hoop. They would just be out there, playing all the time. They were kind of inseparable. That doesn’t always happen in movies. Usually, all the actors do their work, and then go off, in every different direction, to do whatever they do while they’re waiting for the next shot. There was a lot of together time, which really helps the relationship in the story. How did you go about establishing your own level of trust with Ruby, to get the performance you wanted from her? SPIELBERG: It happened the first day she walked onto the set of Bridge of Spies in Berlin. It happened instantly. It was immediate. Not only did I feel that way about Ruby, and we instantly had a huge like of each other, but I went crazy for her sister, Darcy, who immediately took my last name and changed it, and for two and half or three months called me “Cheeseburger,” every day, and still does. Her dad and mom are wonderful people. We became very close to her family, and not at the end of shooting, but before we even began shooting. The late Melissa Matheson got very close to Ruby, Darcy, and Paul and Sarah, her mom and dad, and spent a lot of time on weekends with them. I went home on the weekends, but Melissa stayed in Vancouver and spent a lot of time with them. This is my 29th or 30th movie. I’ve have a lot of great companies. This is in the top five of my favorite companies, or ensembles, that I’ve ever worked with. You’re getting ready to start Ready Player One, which is a story that’s heavily drenched in nostalgia for an era that you defined, in a big way. Is that weird? How do you keep from making that a victory lap that says, “Look how awesome we were in the ‘80s”? SPIELBERG: I think we were pretty awesome in the ‘80s. I hope the movie returns all of us to the awesomeness of the ‘80s. I love the ‘80s. I think one of the reasons I decided to make the movie was that it brought me back to the ‘80s and lets me do anything I want, except for with my own movies. I’ve cut most of my movies out of [Ernest Cline’s] book. Except for the DeLorean and a couple of other things that I had something to do with, I cut a lot of my own references out of the ‘80s. I was very happy to see there was enough without me that made the ‘80s a great time to grow up. The BFG opens in theaters on July 1st.